Get embed code for this episode. | For other embed code options click here | audio Download the MP3 File (127.29 MB) . From 1966 to 1968, Rogers served as a draftee in the US Army for military service during the Vietnam War. In 1970, Rogers joined investment bank Arnhold and S. Bleichroder, where he worked with George Soros. In 1973, Soros and Rogers both left and founded the Quantum Fund. During 1970 - 1980, the portfolio gained 4200% while the S&P advanced about 47%. The Quantum Fund was one of the first truly international funds. In 1980, Rogers decided to "retire", and spent some of his time traveling on a motorcycle around the world. Since then, he has been a guest professor of finance at the Columbia Business School. In 1989 and 1990, Rogers was the moderator of WCBS' The Dreyfus Roundtable and FNN's The Profit Motive with Jim Rogers. From 1990 to 1992, he traveled through China again, as well as around the world, on a motorcycle, over 100,000 miles (160,000 km) across six continents, which was picked up in the Guinness Book of World Records. He tells of his adventures and worldwide investments in Investment Biker, a bestselling book. In 1998, Rogers founded the Rogers International Commodity Index. In 2007, the index and its three sub-indices were linked to exchange-traded notes under the banner ELEMENTS. The notes track the total return of the indices as an accessible way to invest in the index. Rogers is an outspoken advocate of agriculture investments. Between January 1, 1999, and January 5, 2002, Rogers did another Guinness World Record journey through 116 countries, covering 245,000 kilometers with his wife, Paige Parker, in a custom-made Mercedes. The trip began in Iceland, which was about to celebrate the 1000th anniversary of Leif Eriksson's first trip to America. On January 5, 2002, they were back in New York City and their home on Riverside Drive. 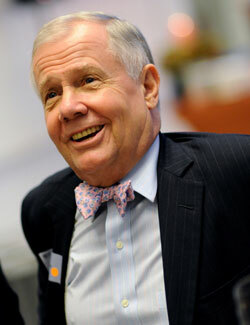 His route around the world can be viewed on his website, jimrogers.com. He wrote Adventure Capitalist following this around-the-world adventure. It is currently one of his bestselling books. On his return in 2002, Rogers became a regular guest on Fox News' Cavuto on Business and other financial TV shows. In 2005, Rogers wrote Hot Commodities: How Anyone Can Invest Profitably in the World's Best Market. In this book, Rogers quotes a Financial Analysts Journal academic paper co-authored by Yale School of Management professor, Geert Rouwenhorst, entitled Facts and Fantasies about Commodity Futures. Rogers contends this paper shows that commodities investment is one of the best investments over time, which is a concept somewhat at odds with conventional investment thinking. In December 2007, Rogers sold his mansion in New York City for about 16 million USD and moved to Singapore. Rogers claimed that he moved because now is a ground-breaking time for investment potential in Asian markets. Rogers's daughters speak fluent Mandarin to prepare them for the future. He is quoted as saying: "If you were smart in 1807 you moved to London, if you were smart in 1907 you moved to New York City, and if you are smart in 2007 you move to Asia." In a CNBC interview with Maria Bartiromo broadcast on May 5, 2008, Rogers said that people in China are extremely motivated and driven, and he wants to be in that type of environment, so his daughters are motivated and driven. He also stated that this is how America and Europe used to be. He chose not to move to Chinese cities like Hong Kong or Shanghai due to the high levels of pollution causing potential health problems for his family; hence, he chose Singapore. However, he is not fully bullish on all Asian nations, as he remains skeptical of India's future – "India as we know it will not survive another 30 or 40 years". In 2008 Rogers endorsed Ron Paul, a Republican congressman, for President of the United States. Rogers has two daughters with Paige Parker. Hilton Augusta (nicknamed Happy) was born in 2003, and their second daughter Beeland Anderson in 2008. His book, A Gift To My Children, contains lessons in life for his daughters as well as investment advice and was published in 2009. In February 2011 Rogers announced that he has started a new index fund which focuses on "the top companies in agriculture, mining, metals and energy sectors as well as those in the alternative energy space including solar, wind and hydro." The index is called The Rogers Global Resources Equity Index and according to Rogers, only the best and most liquid companies go into the index. In February 2013 Rogers joined the Board of Advisors of the Coalition to Reduce Spending. In September 2015, he left Indian market saying it is impossible to invest on hope.